Figure 1. Schematic image of the research strategy. To synthesize polypeptide as bio-based structural materials, three engineered pathways using different biocatalysts are studied. 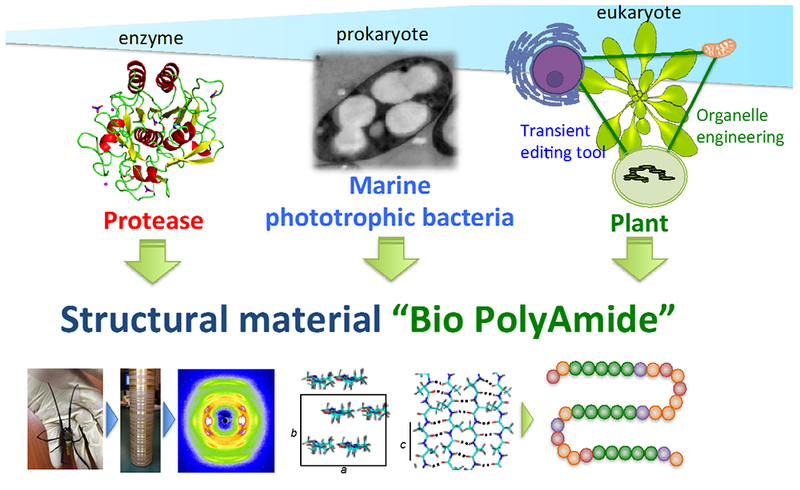 To design the biopolymer-based materials such as artificial spider silk, structure-function relationship of polypeptide is also investigated using structural analysis including SPring8 and NMR in Harima and Yokohama institutes, respectively. Figure 2. Schematic image of spider spinning mechanism and industrial applications as structural or apparel material. Figure 3. Schematic image of polypeptide-based gene delivery system to plant mitochondria. My research group is the first group that has successfully modify plant mitochondria to improve plant bioproductivity. The same strategy can be used to modify plastids and the other organelles. Copyright © RIKEN. All rights reserved.